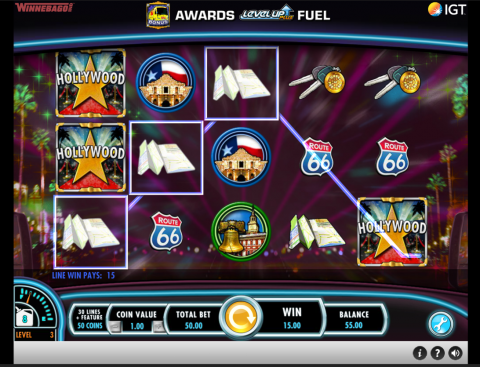 Wheel of Fortune on Tour Slot Review - IGT Wheel of Fortune New Game! Wheel of Fortune slots have been around since the old electro-mechanical games were the main format. 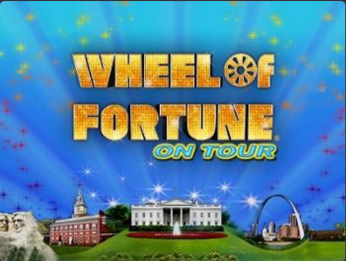 The new ‘Wheel of Fortune On Tour’ adds some decidedly up to date elements – though keeps some of the old icons, including the familiar spinning wheel. In this new game you’ll find a progressive element. You collect fuel, climb levels and unlock better bonuses. There are also random wilds, and a soundtrack which is very much up to date! This review gives you the details of the setup and bonus rounds. If you are outside of the US, then you can play this game (either for real money or for fun) over at Unibet Casino. You’ll find more than 600 slots including the best titles from all the major software houses. See www.unibet.com for the full list. The first thing you’ll notice is the upbeat rock guitar music and engine sound effects – a real departure from previous Wheel of Fortune slots. The shouts of ‘wheel-of-fortune-yeahhhh’ when you trigger the bonus round are familiar to anyone who has played these games before. Symbols are all the iconic sights around the US. You’ll find the Liberty bell, statue of Liberty and Mount Rushmore – along with the star from Hollywood’s sunset Boulevard and the Route 66 sign. There are filler symbols too including car keys and a map. There are 30 win lines on this 30 reel, 3 row slot. Each time you spin it is for 50 coins, that’s 1 coin for each line + 20 coins for the extra bonus features. Wheel of Fortune symbols are the best paying, and are also wild. These will substitute for any of the other symbols in play with the exception of the yellow bus bonus symbols. If you are lucky enough to get a few wheels at the same time you will often trigger multiple wins with different groups of symbols. Yellow Busses and Progressive Bonuses! On the bottom left of the reels is a meter which is made to look like the fuel gauge on a car. Each time that you hit a yellow bus a firework type effect moves towards this meter, which moves the needle a little higher. When it hits full you move up a level, with the needle returning to empty. This keeps on going while you play, and you’ll only notice the effect when you trigger a bonus game. To trigger this you need to hit 3 busses in the same spin, on reels 1, 3 and 5. This triggers a sequence where you see a windy road / map type screen, and your bus moves up however many dots that match the levels you hit on the fuel meter. Along the way are extra bonuses. These are in addition to the main ‘wheel bonus’, which is the traditional spinning wheel with different win amounts around it. After 5 miles, you trigger a free spins bonus game. After 13 miles, the top award on the wheel is expanded to 10k coins. After 45 miles, the wheel gets a multiplier wedge (2x to 5x), you respin the wheel after getting your multiplier award. After 80 miles, you get a spin to win bonus. After 150 miles, you unlock mystery features for the base game which are randomly triggered while you play. This is a good progression for me, with something to shoot for every time. Remember that the regular wheel spin can already win you some decent sized prizes. One more bonus game to mention – the random appearance of the yellow bus. This will drive in and cover the wheels while you play from time to time. When it does you’ll get some extra wild (wheel of fortune symbols) which stick to the reels while the rest of the spots are filled with symbols. There is no guarantee of a win – though those extra wilds often help! I’m on the fence with this slot. It is not a bad game, though it feels like a strange hybrid way to cash in on the popularity of wheel of fortune without really staying true to the original idea. It is almost as if someone came up with a tour concept for a slot (which would work nicely) and forced the wheel game onto it. That is not to say it is a bad game, it is a very good one in many ways. I feel that it is more likely to get general slot fans interested in the Wheel of Fortune games than to appeal to those who already enjoy the more solid and traditional wheel slots. Take it for a spin, and decide for yourself whether this is worthy of the brand! You can enjoy the Wheel of Fortune on tour, together with 600+ other titles – and take 50 free spins (on Mega Fortune Dreams) with your first deposit over at the acclaimed www.unibet.com – check it out now!